Megaderm has been developed to optimise the synergistic effects of Omega 6 and Omega 3. It is an Essential Fatty acid supplement for dogs and cats. Megaderm brings its balanced formula with all the important essential fatty acids as well as vitamins and trace elements to balance the skin's metabolism. How does Megaderm® influence inflammatory skin conditions? 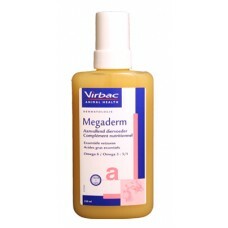 Megaderm limits the outcome of the inflammatory processes by modifying EFA metabolism in the skin. This influences the metabolic pathways of Poly-unsaturated fatty acids (PUFAs) that are involved in the inflammatory cascade. Activity is achieved by depriving the inflammatory process of its initial substrate (the arachidonic acid, W 6), inhibiting its potential metabolic conversions, and diverting the metabolic pathways towards fatty acids that will produce anti-inflammatory (or less inflammatory) mediators instead of pro-inflammatory mediators. Why use Omega 6 and Omega 3? The synergistic effects of W 6 and W 3 EFAs are beneficial as well in restoring skin integrity and providing an anti-inflammatory effect, by the control of PUFAs metabolic pathways. Omega 6 are well described for maintaining good coat quality by maintaining water balance and cell integrity, modifying cell proliferation, and maintaining lustre whilst minimising seborrhoea. In contrast Omega 3 has limited specific coat quality activity but is a key influencer of the inflammatory cascade. Due to innovative pharmaceutical preparation, the ingredients can be easily absorbed. 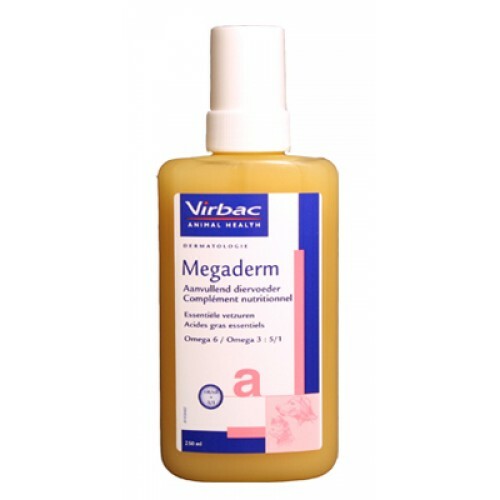 Megaderm thus supports the skin function; such as various dermatological changes and hair loss. Megaderm is a tasty emulsion and can be easily mixed in the food. AST Vetaderm for skin problems and against hot spot for dogs and cats. Malaseb Medicated Shampoo for dogs, cats and horses.